I adore my pal Caroline. She’s smart, funny, loyal as all get out, a helluva cook and she makes me laugh. All things I value in my friendships. We used to work together at a wonderfully quirky place, sharing a cubicle and basically spending an inordinate amount of time cracking each other up, talking about food and bitching, as coworkers are apt to do. We enjoyed ourselves. Oh and did I mention she’s a pretty great blogger too? Well, she is. Most importantly, she’s also my loyal Hot Doug’s companion and someone I baked a ridiculously awesome cake for. Girl’s got it going on. Recently she asked if I had some time to help her out, and fancy that, I did! Spending a few days in the office with her is as funny as ever plus we bring snacks, just old times. Bonus! Today I brought in some of my quiche and last week she gifted me with the most delicious bran muffins. They were moist, flavorful, tender and not at all what you would expect from something that is supposedly “healthy” and “good for you” (ironic quotations marks intentional.) I actually eyed the extra one on her desk, planning some stealth moves to swipe it before she noticed. Pathetic. Over the weekend, I picked up an organic produce box I’d ordered from a local market and looked around as they bagged up my loot. (Come to think of it, she was the one that turned me onto this place.) There was a nice little Bob’s Red Mill display and the unprocessed wheat bran caught my eye. Caroline’s muffins. Must. Make. Now. Into the bag and out the door we went. Didn’t even stop to think I’d need other ingredients. I was winging it. 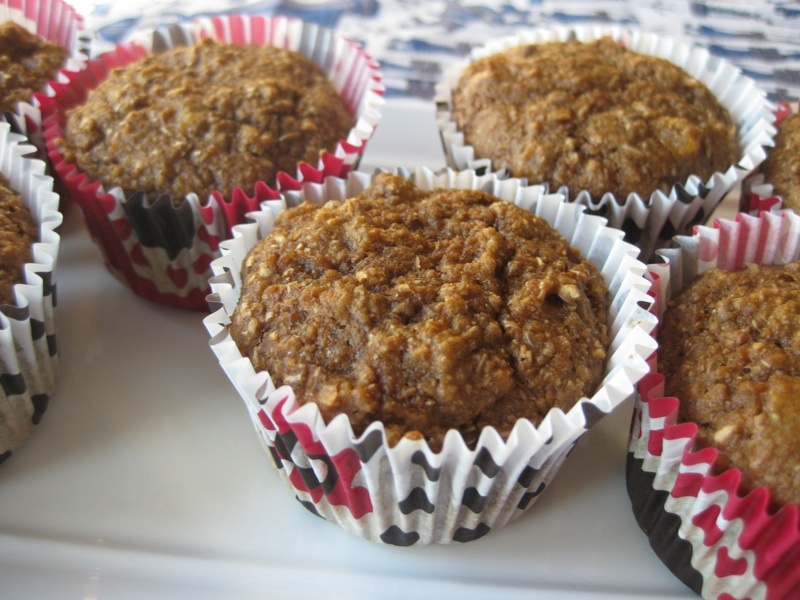 Once home, I brought up her blog and realized there were TWO recipes for bran muffins. Oh crap. Which one? Toggling back and forth between the two, I couldn’t determine which one I had eaten. The girl has a long documented love of buttermilk so was it that one? Or was it the other one, sweetened with molasses? I fired off a text and tapped my feet in anticipation. I got antsy when a reply wasn’t fired back in 3 seconds so I called. Voicemail, dang. Geez, you’d think she was busy with her family or something. Couldn’t she sense this was of the upmost importance? A national fiber emergency! Five minutes later with no response, I just went with my gut, choosing the molasses version and tweaking it a bit. I liked that it didn’t have any added sugar and I love the dark spicy undertones that molasses adds. Since the recipe called for 1 cup of milk and I had some leftover buttermilk I just made that switch. Figured I’d combine the best of both and even out my odds. The recipe called for raisins and nuts but I went in a different direction. Nice planning, eh? I’d found a bag of flax seeds while rooting around in the freezer for the whole wheat flour and figured what the hell. So I threw in a few tablespoons and some diced apricots. Fact is, I couldn’t even tell the seeds were in the baked muffin. Hidden nutrition like that is so sneaky. These muffins were just as good as I remembered. Perhaps a little lumpy (hers were prettier) and I should have filled those papers a tad more. The best part? They stayed moist forever. Many many days in a Ziploc. After a week I tossed the extras in the freezer and they defrost like a dream. It’s ridiculously easy to tuck one, or two (or maybe three) in my work bag as I’m running out of the house like a madwoman. Since they’re not loaded up with sugar, I actually feel good about eating them. Just watch out … all that extra fiber will catch you off guard if you’re not expecting it. Just sayin’. STRESS THERAPY BAKING FACTOR: YUM! Good for you and tasty too! Really, when does that ever happen? These are great for pawning off on the kids; they’ll have no idea. Caroline told me her toddler announced that these are her very, very favorite even more so than cupcakes. Go figure! I don’t know that I’d go that far – I got many years of good eatin’ on that kid – but these are pretty dang tasty. I may have even tossed about some ridiculous notion about eating healthier in the new year. I figure these are a pretty good start so spread the love and be sure to share. There’s no processed sugar in this recipe, just molasses, and you’ll never miss it. The molasses and dried apricots add all the sweetness you’ll need. In a large bowl, combine the wheat bran, whole wheat flour, baking soda, baking powder and salt. Stir in the diced apricots and flax seeds. In a separate bowl, blend the buttermilk, molasses, applesauce, oil and eggs until blended. Add wet ingredients to the dry and stir until just moistened. 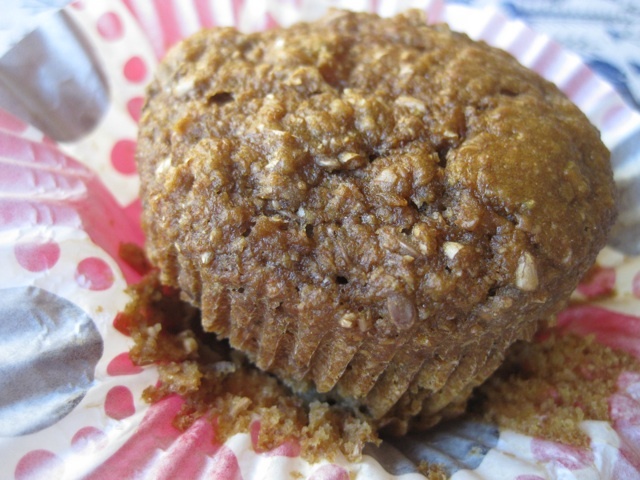 Spoon into greased or paper lined muffin tins, ¾ full, and bake for 15-20 minutes until a toothpick inserted just off center comes out clean but with moist crumbs. Let cool then store in a Ziploc bag or freeze for longer storage.